For restaurant-style dining at home, try this roast duck breast recipe with the sweetness of Vino Cotto. Pre-heat oven to 200C degrees. Pre-boil potatoes in salted water until tender. Set aside. Peel beetroots and cut into quarters. Place beetroots in a bowl, scatter thyme, garlic, Vino Cotto, a tablespoon of olive oil and then season with salt and pepper. Toss to combine. Place all in foil and enclose. Transfer to a baking tray and roast for 15 – 20 minutes or until beets are tender. Remove from oven and keep warm. Heat a char-grill or heavy based sauté pan to very hot. Season the duck breast and place skin side down on the griddle to sear. Sear for 2 minutes or until golden and crisp. Then turn over and sear for another 2 minutes. Place breasts on a standing tray in a baking dish and roast in a hot oven for 10 minutes to finish the cooking. Transfer to a warm plate, cover loosely with foil and stand until rested (5 minutes). In the meantime, cut potatoes into quarters and fry in olive oil until golden, or use the duck fat left in the pan to fry the potatoes. Slice the pear thinly and grill. 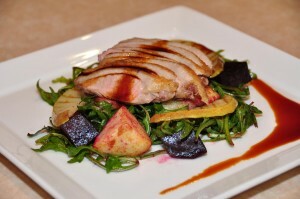 To serve, place rocket, beetroot, potatoes and pears on serving dish. Add some of the beetroot juices over salad. Cut duck breast thinly at a slight angle and fan out on top of salad. Drizzle some Vino Cotto on duck breast. Buy the Vino Cotto you need for this recipe online. Click here. What is Vino Cotto? What is a Vincotto reduction sauce? My wife made this last night for dinner and it was spectacular. Thank goodness for Vinocotto – Love it! What a fantastic product, love the flavour. Tania D. - Vic. Beautiful flavour and very consistent. Michael C., Chef - Vic.